So many times you want to start a project but you do not have the exact fabric suggested or you want to stitch the pattern on different material. In other cases, you may have eyesight problems that prohibit you from using a smaller weave fabric. You need to convert linen to Aida cloth or vice versa; but how do you do that without skewing the final project? How will you know how much fabric to use? Don't stress out! There is a very easy formula that allows you to go back and forth between the different types of fabric. Let's say that your pattern calls for 28-count linen but you would rather Aida. What size count of Aida cloth do you use? You could simply wing it, but you run the risk of not having enough fabric or, just the opposite, and wasting fabric. Since cross stitch on linen is done over two threads instead of over one square as with Aida, to convert fabrics from Linen to Aida, divide by two. Thus, substitute 14-count Aida for 28-count linen. Does that make sense? So, if you have a count of 28 you are going to divide it by two...you get 14. Don't forget that it will affect the size of the project you are doing. Your project will be bigger, not smaller. Linen is very tightly woven and very small squares. Aida does come in smaller sizes but not nearly as small as linen. If the division is not even, substitute the closest Aida count you can get. Remember, if you are stitching from a kit, be careful with what fabric you substitute so that you will not run out of floss. You might want to buy a few extra skeins of floss for the project, just in case. This is will save you much headache if you run out mid-project. If you don't use the floss, you can save it for another project. One thing to watch out for when converting fabrics is that some patterns may include specialty stitches that are a bit more difficult to stitch on Aida. You may need to add other elements to the final project to compensate for the change in stitches. 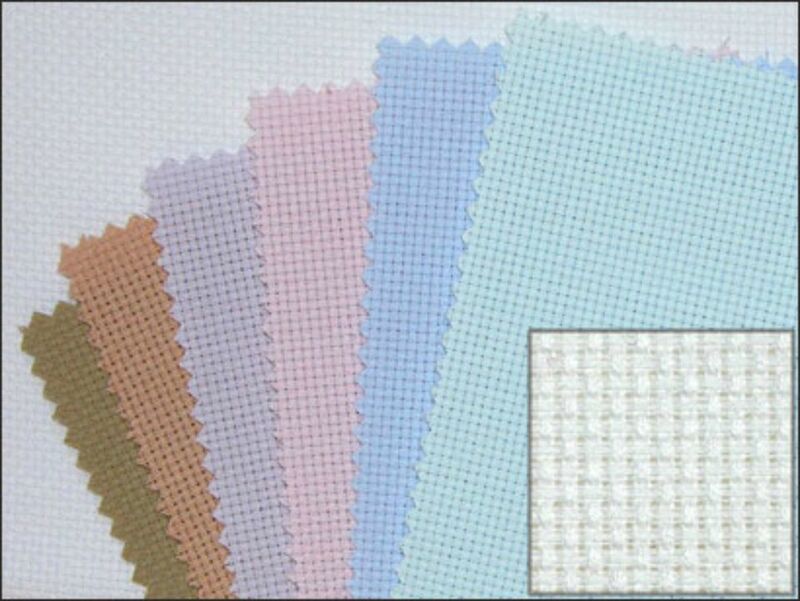 For help with determining fabric sizes for projects, see the Cross Stitch Calculator. This is such a helpful tool. Enter the specifics of your project and it will give you the correct calculations and the size the finished project will be. The cross stitch calculator will tell you exactly how many stitches your project will be. This is a great way to focus on the joy of stitching and not be weighed down with figuring out conversions. This tool is perfect to get the exact measurements for the project. ​Sew Along's website has pictures of each style of fabric so you can see the difference when you are deciding which fabric to go with. It also helps with understanding the equation above. You can see what style of fabric you want for each project and not second guess your work. It also has an excellent graph with the different amount of stitches and what fabric works with what projects. Check out the pictures and the graph on their website. Whether you are love linen or are strictly an Aida cloth user; it is up to you. There really is no right or wrong way to go about picking your floss. It is 100% personal preference. To get the best feel of what fabric you love the best, try both. If you are scared of the smallness of linen, create a test sampler to try different stitches for the fabric. You can do this for all sorts of fabrics. This will also give you a feel of how much floss you will have to use. Of course, with linen, you are going to use less floss and with certain Aida fabric, a bit more. Also, check out the colors of the fabric. If you are not finding one you like try dyeing your own or try going a size up or down with different fabric texture. Pump up your cross stitch skills with this simple workout.